Good afternoon everyone , I do hope you are all well. I have had a few aches and pains this week, but it doesnt stop me doing things, so therefore got quite a bit of crafting done while I have been sitting alot ha ha. Here are a few cards I have made I will give you a run down on how I made each one. The first one being very Bright yes Purple and yellow, I covered the base card in purple backing paper,all used from the Dreamees Back to basics cd rom available at www.dreamees.org.uk as are all the items I have used in making the following cards. 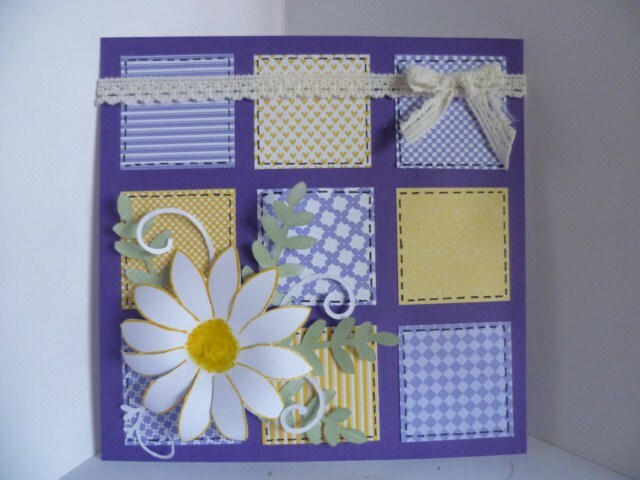 I then cut 9 pieces of my chosen backing papers into squares, to make the faux patchwork effect, which I attached to the base card. Then I added the lace strip, across the top of the card and made a bow with the same lace, attached this to the right hand side of the lace. I then stamped the Large Flower 2 ,again from Dreamees in the Mustard Seed distress ink pad and coloured the centre in the same yellow, cut this flower out and attached to the main card in the bottom left hand corner, then I used embellishments with the die cut leaves and swirls again available from www.dreamees.org.uk. The second card, is one of my faves I have made for a long time in my opinion. The papers are from Dreamees Elegance cd. I first of all covered the base card with the stripe backing paper which give s a lovely base to the card, I then matt and layered a piece of the pink and green paper , added it to the right hand side of the base card, then again matt and layered a strip of the backing papers and attached across the card hanging over the edge a little and then made the flag effect on each end. I cut out an oval scalloped and straight edge nestabilities die, stamped Dreamees Baubles stamp in the centre of the straight oval using Victorian velvet Distress Ink Pad, and while in the oval die I distressed the base of this oval to give a shadow effect, added glue using the quickie glue pen, added glamour dust silver to give the sparkle to the Bauble stamp. matt and layered these two ovals together, attached to the base card slightly to the left of the card. I cut another scalloped nestie out in the green backing paper and stamped the Recipe of christmas stamp again from dreamees (this stamp is amazing) added the oval to the top left hand corner of the main card. I then stamped 3, small flowers 1 in the victorian velvet cut out attached to the right hand side added 3 small green button s to the centre of each flower. I cut 3 different sized snowflakes from Dreamees Cuttables range of cds available for the craft robo/cameo machine cutting gsd files, just rubbed the victorian velvet ink pad over them all attached these on top of each other added a pink gem to the centre. The card was then complete. 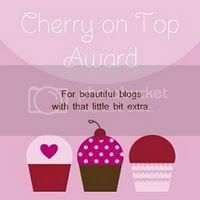 Thank you for taking the time to read this entry on my blog hope to see you all again soon.